Since I’m a little obsessed with pink at the moment I figured I might as well show you Sophie’s curtains. I bought this fabric to make curtains…it’s a really nice weight and at $7.48 a yard it cost less than buying them (I used 5 yards). I measured from rod to floor and added 12″ for each panel. I have a Polka-dot obsession…big time. You are so funny! Sophie's room is darling. I think of you whenever I pass the little donkeys down the road. Did you ever make the Cream Sticks? I need curtains in my room, but I need 9 yards of fabric!! I want to cover the whole wall since the window was waaay off center and our bed is parallel with that wall. So I'm trying to decide if it's worth buying that much fabric or what I should do. Too cute!! And there is no such thing as too much polka dot…at least in my happy little world! Aren't polka dots such happy little things? Your sweater is too cute! What a darling little room! Mother and daughter matching tops!Love the curtains. How cute! 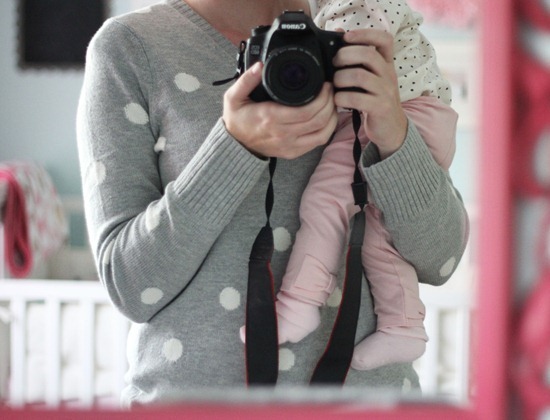 Seeing your gray sweater with the white dots makes me think you should paint big white dots on a portion of her wall! Maybe wrapped around a corner or something. Precious from the curtains to the shirts. What an asorable baby room!! The curtains look great but look at that cute little pink bundle on your arm! So sweet! Love those curtains! I'm making a polka dot quilt now. You are not alone in your obsession. I like polka dots too! I like the curtains! I have that amazing "LOVE" print in a gray frame in our living room. I adore it! Precious! Oooohh…and as for polka dots. I'm a polka dot, stripes and chevron nut. It's bad. They are wonderful curtains, just perfect for a little girl and a big girl too. Dots are fun, like Mother like Daughter. 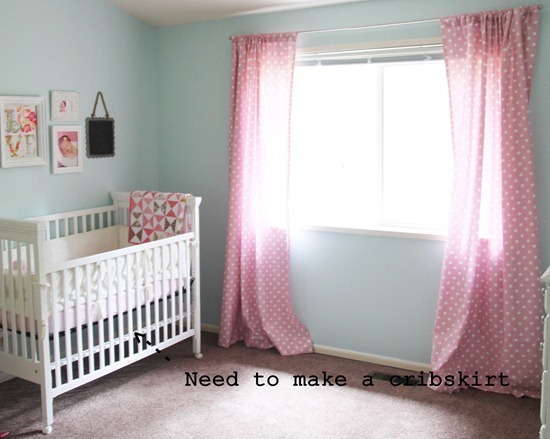 My daughter's room has polka dot curtains, crib skirt, & changing pad cover. You can never have too many polka dots! I love the wall color too by the way! I bought the same sweater. Love it! The curtains are really cute! Sophie's room is so cute!! Love the tiny feet in the picture!!! Her room is so darn cute. I have four daughters and never got sick of pink! I do miss doing hair (they are 26-16) although it would get a little hectic before church when they were little. The hubs would comb their hair out and then I would do whatever I was going to do with it. Then it was finding all the pairs of dressy shoes at the last minute…. I miss it! Glad you are thoroughly enjoying your time with your family! It does go fast. I LOVE Sophie's room! The curtains are perfect for it. Love pink and dots! Enjoy your little bundle of joy. Cute!! I often notice an excessive amount of stripes in our clothing. Polka dots are much cuter. Same here. I loves me some polka dots! Very cute room. I think I need that sweater! When my son was learning to talk he called them "polkanuts". I've been obsessed with them, too, ever since. Gorgeous pink curtains. Love the Polka Dots. Polk-a-dots are so darn cute and nothing says fun like polk-a-dots! Love the curtains! 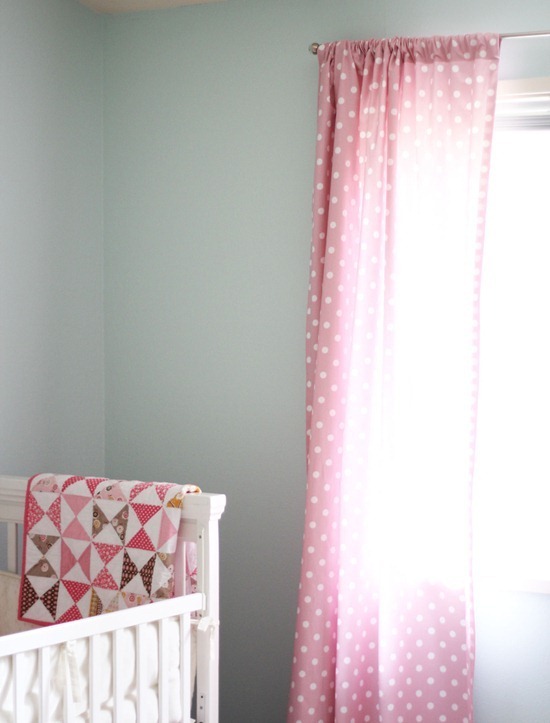 As an aside, do you remember what paint color you used for the nursery walls? It's gorgeous and I'm having a hard time picking out colors for our new house right now. Thanks! I love Sophie's room and the polka dot curtains are absolutely perfect!!! I gotta make some for our bathroom! Thanks for sharing. this is so pretty, I love the room, and your sweater! I just ordered some polka dot fabric to make my daughter's curtains. I have been trying to decide for a few months what to do for her curtains -thanks for the inspiration! I love these! I am thinking about making curtains for my daughters room. Do you feel that this fabric blocks the light? Also, it looks like the link doesn't work anymore, I was wondering if you could provide a new link? I love the nursery!! Lindsay I couldn't find your email…but I do think these block the light a bit…except I like that during nap times and in the early morning. :) They are from fabric.com and I don't see the fabric there anymore..sorry!